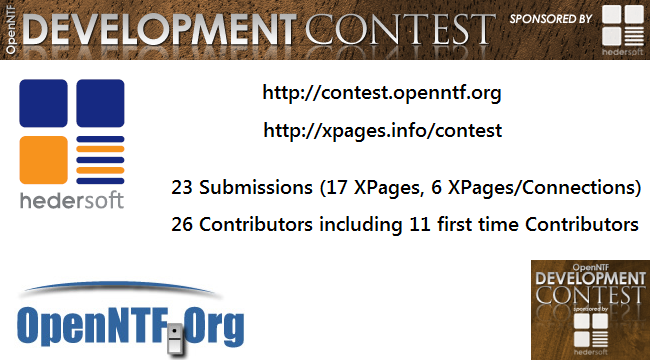 For the fourth time OpenNTF hosted a development contest. I’m very happy with the outcome! The contest was a big success again with a lot of high quality submissions. The trend that we already observed in the last contest continued. The quality and the functionality of the projects gets better and better. Since the judging is still going on, I won’t write about specific submissions yet, but I’ve planned to write another blog entry with some highlights later. For now you can check out the submitted projects yourself. XPages.info/contest lists all submissions including videos and screenshots. In total we received 23 submissions. 17 submissions in the ‘open’ category and 6 submissions in the new category where we asked for projects that demonstrate how IBM Connections can be extended via XPages and how custom applications can leverage IBM Connections. 26 people submitted projects. 11 of them were actually first time OpenNTF contributors. In all four development contests in the last two years we’ve had 50 new contributors! I want to thank everyone who participated and especially welcome the new contributors to OpenNTF: Stephen M Keller, Shashwat R Math, Stanislav Marszalek, NithyaPriya Rajkumar, Abeish babu, Aneesh M Nair, Olle Thalen, Doug Tait, Vasiliy Solyanik, Ryan Buening, Köll S Cherizard, Jeremy G Hodge, Linoy K George, Gayathri Viswanathan, ruud van reede, Weihang Chen, Jesse Gallagher, Ulrich Krause, F van der Linden, Thomas Adrian, David Marko, Adam Foster, Martin Rolph, Graham Simmons, Rene Winkelmeyer and Patrick Kwinten. A big thank you goes to our sponsor hedersoft, specifically to Henning Schmidt and Lars Buntrock. They’ve been a long term OpenNTF partner and supported strongly the new Connections category. As Lars stated, he is “convinced that the development of social business solutions will soon be key for XPages developers”. And I want to thank the OpenNTF board for defining the strategy and process of the contest, esp. the chairman Bruce Elgort and Peter Tanner who cleared in his role as IP manager the releases again. The OpenNTF board of directors is now doing the final judging. Four technical XPages experts have already done the pre-judging: Corey Davis, Per Henrik Lausten, Christian Guedemann and Mark Leusink. I also want to thank them. They did an in depth analysis of all submissions using the contest criteria and that was actually a lot of work. I’m afraid I sound like a broken record, but again: There is one winner already – the XPages community.